Splendid house/farm of 230 mq. with swimming pool surrounded by a beautiful flower garden on a hilly terrain of 13 hectares with vineyards and olive trees. In the estate you can see farm animals in the natural state, a rusciello and a small lake with various species of birds, available for guests a beautiful garden where they can collect with their hands all the seasonal vegetables to cook or eat Fresh. The view is on the lake of Bolsena and its islands, Martana and Bisentina. The location is ideal for visiting the nearby art cities of Tuscany and Umbria, among which Siena Orvieto Montalcino etc. The beaches of Monte Argentario are about 1 hour away by car. In the estate they work the keepers that are available for any eventuance. Splendido casale/Fattoria di 230 mq con piscina circondato da uno splendido giardino fiorito su un terreno collinare di 13 ettari con vigneti e olivi.Nella tenuta potrete vedere animali da fattoria allo stato naturale,un rusciello e un laghetto con varie specie di uccelli ,a disposizione per gli ospiti uno splendido orto dove potranno raccogliere con le loro mani tutte le verdure di stagione da cucinare o mangiare fresche. La vista è sul Lago di Bolsena e le sue isole, Martana e Bisentina. La posizione è ideale per visitare le vicine città d'arte della Toscana e dell'Umbria tra cui Siena Orvieto Montalcino etc. Le spiagge del Monte Argentario si trovano a circa 1 ora d'auto. Nella tenuta lavorano i custodi che sono a disposizione per ogni evenienza. Our family stayed at this lovely house in early August 2017. We had one of the best vacations ever. The house and its facilities are splendid – large, well-appointed rooms, several terraces, huge grounds, and an amazing pool, even better than what can be seen from the pictures! Everything we needed was there, and Rita and Marco, the caretakers, were stunning. They were there for us whenever we needed something. Our daughters immediately fell in love with the many animals – two dogs, a cat with her kittens, and a whole range of farm animals, even horses, a couple of minutes farther away. We collected our own eggs fresh every day, harvested vegetables and fruit from our “own” patch, and had the most amazing and healthy meals. There is literally nothing that could have been better – we hope to be back very soon! I would like to keep this place a secret but I think it is only fair to the owners to share my review. It is by far the nicest villa I have stayed in over the last ten years and I have stayed in large villa's across Europe. I stayed with my family, seven of us in total aging from 11yrs to 45yrs. The villa itself is in a very quiet lane but only 2km from Gradoli where you can get everything you need. The lake is stunning and there are many little beaches and taverns dotted along its edges. For me the location was excellent. The villa is spacious homely and very well equipped, tastefully decorated and furnished to a high specification. The people who met us were Rita , Marco and Yassime who were absolutely delightful and could not have been more helpful. Nothing was too much trouble. The villas is set in acres of land with a huge veg patch where you collect all you require and eggs are plentiful from the chickens and ducks. We only had to buy pasta and bread and the odd bit of meat the entire week! I would return to this villa as there is still so much of the area I am yet to discover. This part of Italy does have mosquitoes so come equipped with your spray and candles for around the pool and outside in the evenings. Great villa , beautiful location , lovely people. We had to pay a cash deposit on arrival as you do for most villas in the case of damages. But they gave it back to us in full no problem at all. Dear Andrew thank you for your words I hope to see you on vacation in the beautiful farm house Le Cannelle a big ciao .... Arrivederci!!! We have just returned from an absolutely terrific 3 weeks in Le Cannelle. It is a little slice of paradise. The house itself is clean, well decorated and very comfortable. One gets a feeling that a lot of love is being put into every aspect of this estate; from the house to the exquisite pool area, and from the garden to the farm area with horses, goats, rabbits, geeze and chicken. We were two families of 4 and for the kids there was plenty of entertainment on the 20 hectare estate itself, swimming in the pool, visiting the animals, finding eggs from the chicken coop, and picking peaches, water melon, zucchini, eggplant, herbs, potatoes, tomatoes, cucumbers and onions from the fruit orchard and vegetable field...(also don't forget to ask Marco to sell you a liter or two of the house olive oil to take home with you). For grown-ups Le Cannelle is a perfectly located oasis of tranquility within easy reach of picturesque villages, historical sites, the beautiful Lago di Bolsena a few minutes drive away and even the Mediterranean not an hour away. Marco and his wife, Rita, are Captains, caretakers, heart and soul of Cannelle and make sure everything always works and in the rare case something needs fixing , do so with a speed and effiency I have not come across ever before when renting. I agree fully with the reviews of both Stef K. and Johan V. before me so no need to repeat everything already written in those reviews. In short: it is hard not to fall in love with this place. We stayed at the house from 26.7.2015 until 8.8.2015 with two families, 4 adults and 3 children in the age of 14,14 and 16. We all have enjoyed a great stay there. The house is big and nicely decorated, a warm and cosy feeling. The house has air-conditioning in every room accept the kitchen but that is no problem at all. The kitchen is well equipped. The environment surrounding the house is breath-taking and huge and the lake of Bolsena offers an nice view from the house. The swimming pool is large and is situated approx. 50 meters from the house between the olive trees. At night, with all the garden lights on, it creates a beautiful picture. The landscape surrounding the house is developed and there are animals and also a fruit & vegetable garden at your disposal . Although we are not the self-sustaining-type we enjoyed picking our own vegetables and fruit. Gradoli itself is not a big place but there are many towns you can visit and were you can enjoy the Italian culture and food. The family (managing the place) is very friendly, nice and helpful in every way. Thank you for a great stay at the house. We really loved 'Le Cannelle', such a great place to stay. A beautiful house with two cosy terraces.The house was very clean and nice decorated. We had two fantastic, relaxing and peaceful weeks, living the Italian-country-side-life. The big garden was super, and how nice it was picking our own vegetables. 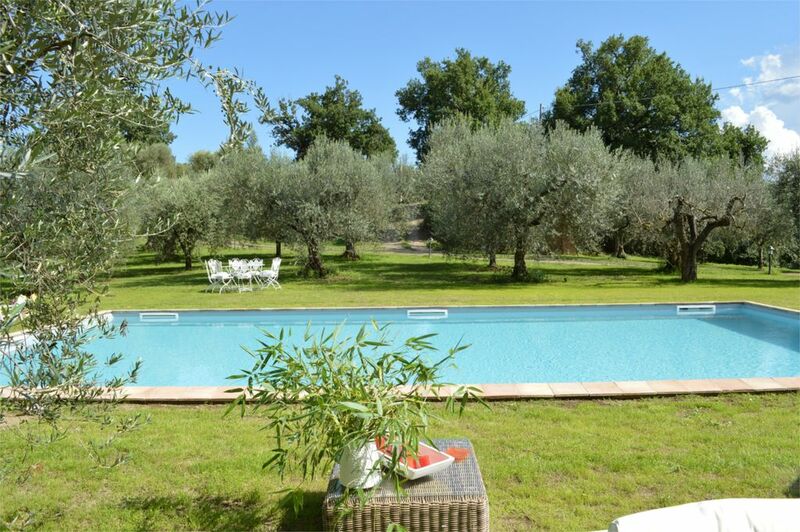 The pool, with chairs under the olive trees was nearly to good to be true. All the animals around, stole our hearts. The family who welcomed us was great, thank you so much for making us feel at home!!! Attività balnerari e sport d'acqua al lago, ristoranti tipici, vini rinomati, equitazione, golf (Golf Club Acquapendente a 16 km),terme (Terme di Sorano Spa a 30 km).